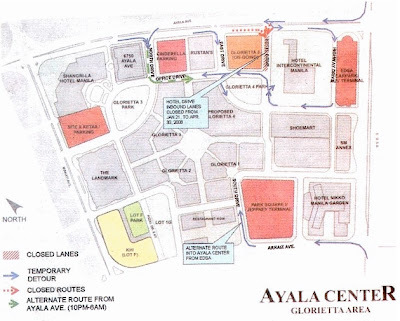 MANILA, Philippines – The Ayala Center has announced the temporary rerouting of traffic in front of the Hotel Intercontinental in Makati City due to the construction of a new access ramp for its Glorietta 5 project. Starting Jan. 21, half of Hotel Drive in front of the Intercon will be fenced off to make way for the new ramp construction. The road will be closed until the end of April. Ayala Center vehicular traffic will be rerouted with entry from Ayala Avenue diverted to Highway Drive behind Hotel Intercon. Vehicles coming from Edsa that usually turn left to Ayala Center will now be made to make a U-turn towards Highway Drive. The two lanes exiting from Hotel Drive to Ayala Avenue will be reduced to one lane. Ayala Center management has made the necessary arrangements for the installation of traffic signs as well as the deployment of additional traffic aides for the rerouting scheme. Ayala Center patrons are likewise advised to enter the area through Arnaiz Avenue (formerly Pasay Road) and Makati Avenue access points. For more information, please call the Ayala Center Hotline at tel. no. 706-0618 everyday between 8 a.m. and 11 p.m. ano?? mall na naman sa ayala?? ano ba yan?? tama na yan!! plant na lang some trees! !